Series devoted to saving treasured heirlooms from the scrapheap. 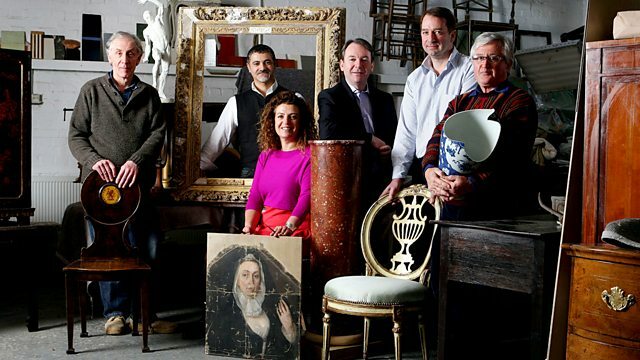 Eric Knowles and his group of talented restorers tackle a pair of water-damaged Edwardian chairs and a Minton jug. Hi, I'm Eric Knowles. Now, antiques, heirlooms and collectibles, we've all got them. But are they tired, broken, faded, and maybe even destined for the bin? Well, on this programme, we could bring them back to life, and maybe even make you some money. Welcome to Burghley in Lincolnshire. restoration, helping to make it one of the most popular stately homes in the country. as scores of people have arrived with all manner of this and that. Everyone's keen to know how much they're worth. I think she's worth £200, £300, that sort of figure. -You've got some damage to the top. -Yes, I had a guest who wasn't very careful. -And will they make any money at auction, or end up back at home? Coming up, will a knight in less than shining armour make a profit for its owner? £100. Good for an item. 110. 120. Can ceramics restorer Roger Hawkins resurrect a damaged Minton jug? Furniture restorer Tim Akers has a restoration rethink when he hits a major snag. clean it and wax it, but that hasn't worked. And will these Edwardian chairs make a pretty sum at auction? 200 for them, pair of chairs. Burghley House is a fantastic venue for today's Restoration Roadshow. But stately homes always have their share of restoration challenges. And we'll see later how stonemasons are trying to restore the building. and now is subject to erosion. Back at the Restoration Roadshow, the restorers are certainly attracting a lot of interest. Our first needy patient, a battered Victorian writing desk that is literally falling apart. -amount of action over the years, hasn't it? In the family since the '50s. -in the town, and my mother worked for them as a housekeeper. Their estate was eventually wrapped up, and she bought it then. It's a bit the worse for wear. which I imagine is something to do with age. but this one's about to spring a surprise. How ingenious - a built-in sloped writing section. Which makes it just that little bit different. It certainly works in its favour. Can you remember what your mama paid for it? Not a lot, I suspect, no. Have you ever given any thought as to what it might be worth? A couple of hundred pounds, possibly, on a good day. Maybe a bit more. Maybe 300. In this present condition. you know, to give it back a certain amount of respectability. We had talked about doing it for years, but this is a really good opportunity. So it's decision time. Are they going to take it home or sell at auction? -I do actually use it. I have a suspicion that my wife might like to get rid of it. -We can pass it down to the next generation. before turning his detective skills to furniture restoration. He's conserved some of our stately homes' finest treasures. It is a splendid-looking desk and these leathers are absolutely wonderful. I think I would leave them. The veneer needs some work, as you can see. The most major work is on that bottom drawer. rather too long, they make little grooves in the linings, here. And then when they make grooves in the linings, of course the veneer comes off. And also the other thing that causes this, the carcass starts to move. so if you rock it, you can actually see it's loose. But overall, I've seen a lot worse, put it like that. How much do you think it'll cost to put it right? I suppose around the £300 mark, something of that sort. -Yes, we want to keep it in the family. Roy's desk is in need of some serious cosmetic surgery. For £300, Malcolm is going to fix as much of the mahogany veneer as possible. But with so many missing pieces, he'll have his work cut out. with unusual DIY attempts at restoration, not all of them elegant. Quite simply, somebody has taped it up. Some items can be restored but more often, the solution would be just too costly to attempt. Roger Hawkins is a top ceramics restorer. as he is with monumental Mason vases. Right now, he's pondering over what might have been a valuable Minton jug. It belongs to Anne Johnson. It's very battered. It came to me, I looked at it and thought, oh. And so I've kept it propping up a family photograph for years. And I thought it might be a Minton fake. It's perfectly genuine. But what interests me is the handle. It's metal. This was damaged, there's the remains of the original handle. Oh, dear. In mint condition, it would be worth £200. But it's a fact on Restoration Roadshow, not everything can be restored, let alone go to auction. -That metal repair is actually quite a good one. because it would cost twice as much as the value of a perfect jug anyway, it would just cost too much money. -I'll keep it on my family treasures, shall I? Thank you for bringing it in, very, very interesting piece. Restoration is often about putting missing pieces into place. So it's great to find a couple of Edwardian chairs just made for each other. Sisters Juliet Jones and Liz Rotherer have brought them in but unfortunately they're badly damaged. Tim Akers loves delving into an item's history to reveal its past. So we have a very pretty pair of corner chairs here. of putting the tapestries on. She was very into her tapestries. So have you always had them together as a pair? No, my mother parted with them, one to my sister and one to myself, before she died. I've used mine as a bedroom chair and my sister has used hers as an office chair. Well, it's lovely they've come back together. I think so, yes. I think they should be a pair. They should and often with pairs, they do get divided and they never actually come back together. Because they're a pair, that actually helps the value of them as well, which we'll talk about. Let's just look at the areas that there is some damage. This one has quite a lot of water damage to it. I think probably you've had it by an open window. Because it is so splattered. Sadly, water is to furniture what sugar is to tooth enamel. patches of discolouration, but also undermines the actual structure. Tim's seen this problem all too many times. So how much will it cost to restore them? Are you wanting to keep them or do you want to sell them? No, we're happy for them to go to auction. -OK, the cleaning and the waxing, it would be between 30 and £40, per chair. -Yes, you jumped in a bit quickly there. -You'd like to go ahead? -I would like to go ahead, thank you. In their current state, the chairs are worth a mere £80 to £100. For £80, Tim will polish them up and try and get rid of those water marks. should fetch between £150 and £200 at auction. But things aren't going as smoothly as Tim had hoped. Plan A was to clean it and wax it. Get your thinking cap on, Tim. We're relying on you to make them presentable for auction. our Restoration Roadshow team meets a chap who's been in the wars. And have we made a macabre discovery? They are called hair work but I've never come across one that is actually made using human hair. Burghley House is the home of the descendants of William Cecil since Elizabethan times. dedicated to the maintenance of the house and gardens, but keeping it alive is no picnic. The ornate chimneys on the roof represent a daunting challenge. Clerk of works Alan Scott has been running a long-term project to restore them. 30, 40% of my time is spent on restoring the fabric of the house. We're here to restore and preserve what's been left for us for future generations. which brings its own peculiar problems. Very easy stone to work but with it being so soft, it does suffer from deterioration. because over the years, they have deteriorated. Gwyn Watkins knows that only too well. Resident stonemason and carver, he's been tending to Burghley for over 20 years. This has just lost its strength with time. Lost its character, if you like. And now it's subject to erosion. has been a mammoth task, both in terms of time and money. would cost in the region of £35-40,000. So it's quite an expensive task, that's why we're really budget constrained. We can only manage to do one per financial year. The march of time may be relentless but the conservation team relish the challenge. The satisfaction is to finish one project and get on with another one. I think if you sit back and say, well, that's it, nothing else to do now, that wouldn't be true life. It's just great to have challenges every day of the year. we're getting to grips with our own set of challenges. Malcolm is working away on the chipped and battered Victorian desk. There are lots of gaps to fill and for each one, the veneer must match perfectly. On top of that, he's also got to work like the clappers. The only thing with this stuff is it tends to be fairly quick-setting. wafer-thin mahogany veneer but not just any old mahogany. otherwise it just doesn't match and it looks silly, really. For Malcolm, the trick is to make the mends invisible. But will he be able to find all the missing pieces? Coming up... Tim's under pressure too. His plan to get the Edwardian chairs ready for auction has hit a snag. The water has actually eaten right through the polish into the bare wood. And will the restoration be enough to achieve top dollar at auction? -Oh, they're here, we're on. Life's never dull here at the Restoration Roadshow. We've got all sorts marching in here. Although this chap doesn't look like he's in much condition to storm anything. Glenda Parsley is hoping he can be made fighting fit and earn her some money at auction. Well, I had the cafe in the square in Stamford, the Central Cafe. -And this has been in the cafe for about 65, 70 years. but it was very popular with the children that used to come up the stairs. -Well, indeed it would be. -I used to dress him up as Father Christmas. I can see that, yes! -I used to put little presents around it. -They used to like that. -So you made it like a Christmas tree, really? in late Victorian or Edwardian Britain. Maybe even into the '20s for re-enactments, that sort of thing. -It's not a real suit of armour, unfortunately. that sort of thing, here and there. -And the straps have gone. The leather does, I'm afraid. I think it's rather jolly but I think it's not really worth restoring. and Glenda's decided she wants to take her battered knight to auction. our restorers have certainly been putting their skills to good use. to get them ready for action. He's already tried a simple clean but it hasn't worked, so it's on to plan B.
I'm going to try first of all with just some clear polish. If that doesn't work, I'm going to have to put a little bit of tone in the polish as well. So let's see if we can do that and see what happens. the technique known as French polishing was said to produce the finest finish on wood. Put a little bit of shellac on to the rubber. used in the 19th century, mainly. And it's from the lac beetle. A tiny little bit of meths as well. And then we're going to put a little bit of polish on there and see what happens. This puts a really incredibly thin coat of shellac on. As soon as you put the polish on, you can see the beauty of the wood coming through. But unfortunately, you can also see the horror of the damage as well. The polish has highlighted even more of the white bleaching effect of the water stains. I need to tone the damage, these are the colours here. Every piece of mahogany has its own unique shade so Tim has a palette of colours he can blend together. The tints are meth-based so they'll dry rapidly and mix well with the French polish. That's quite a good colour, actually. It doesn't have to be an exact colour because timber has such a variety of colours to it anyway. which is what I was hoping but you don't know which way it's going to go. Tim's having to work overtime here. But will it be enough to entice the bidders at auction? but it's always a bit special when something of local interest turns up. This picture may look like a line drawing of Burghley House, but it's actually an embroidery. can tell us if it's black thread or something much more macabre. The gentleman who bought this in earlier in the day was told that it was hair work. -Now, what do you think? -Often they are called hair work. I'm not saying there aren't, but I've never come across one that is actually made using human hair. Now, the chimneys on Burghley today have castles, little castles decorating the tops of them. That happened in 1835, 1840. I would think 1810, 1815? OK. As you might expect from a grand house like Burghley, you can always go one better, can't you? Well, the home team always have the best picture, if you like. But yes, this is big brother. Just the smart version, throw in some livestock and a few other little decorative pieces here and there. And of course yours is all the grander for having the family arms. -So the technique here is identical? a lot of it is drawn but the details are highlighted in thread. This picture is in good nick. But it's a different story for the smaller version. -I think there are a few problems with this piece and it does need some attention. half the cause of this breaking up of the threads in the sky here. It needs to be unframed. the object and the glass which will protect it from the contact. And just some very careful, loving care to try to and relay some of these threads. Other than that, it's in lovely order. will help preserve it for future generations. I bet Malcolm's wishing that Victorian desk was as easy to restore! but with all those missing veneers, has his patching been worthwhile? of the world and I have to say, this has been a hive of industry. Remember how tatty and chipped the desk looked? and achieve an amazing transformation. Now, hang on a minute. There was some veneer missing on this. -Oh, right. Listen, have a look. That side, but somewhere along there. -Well, you say somewhere along there, but where? Before, there was a huge hole in the desktop. it's been replaced down here and we've used the same mahogany as the original. So basically we've had to match it, cut it, and then match the colour. I mean, initially, in its original state we said it was worth, what, about £300? -We knew it wasn't worth huge amounts of money. No, and you've just spent £300 on taking it to this condition. the best part of £600-800 without any hesitation whatsoever. So now you've seen it, do you think the boy's done well? -We're very pleased, or I'M very pleased. -The fact is now it's in this condition, I've got to say any second thoughts? Is it something that you might consign to auction or is it staying put? I think it'll stay put. And I now want to keep it more than I want to sell it. and there's been no shortage of folk all seeking advice. But has Tim's artistry with a brush been enough to save the water-damaged Edwardian chairs? Let's pull it back and see what we've got. Before, the chairs were distinctly shabby. its mahogany glow and all the white, bleached blobs have simply vanished. -by hand with a brush. -But actually it went very well. -Beautiful, thank you so much. In their original, tattered state, the chairs were worth between £80-£100 for the pair. For £80, Tim polished them both up and used all his skill to banish the water marks. And our valuers think the newly-restored chairs should fetch between £150-200 at auction. We've seen quite literally the good, the bad, and without wishing to be too unkind, the ugly! Some of the antiques like the newly-restored Victorian desk are going home to take pride of place. But we have two pieces that we will be taken to auction. This old soldier is on his way without a facelift as he's not worth the expense of restoring. And the Edwardian chairs which, after a great restoration, should be worth £150. Coming up... will the armour have the bidders fighting for it? -£100 I have in front, at £100. And will the transformed Edwardian chairs corner the market? It's auction day at Thomas Mawer and Sons in Lincoln. Today's sale is a special one as the auctioneers are selling off the contents of a local manor house. It's attracted bidders from all over the county. Lot 660A, added bids there, £300. and that everything that's been restored will be noted in the catalogue. Lot 648 is a pair of corner chairs. but Juliet and Liz may be having mixed feelings. Are the emotions coming into play here? They are now we're starting to talk to you, they are, yes! Remember, unrestored, we valued them at between £80-100. that they've put a £300 reserve on the chairs. That's going to be a tough ask. -Added bids here, what do we say? -Oh, they're here. We're on. -He's gone in at three, so that's strong. They do that, go in at three, go down at two. Beautifully restored, now come on. -Oh, he's doing the talk-up. £50, who wants them? 50, I'm bid at 50. -They're not going to go for that, don't worry, we've got a reserve up there. I'm looking at who's in there. There must be people in Lincoln with taste, come on, where are you? -We might be taking them home. -No, no, hold your breath. Quite sure? At £150, all done? -Ouch. Withdrawn, he did say. -Do you know what, that's fine. -We're happy to take them home. That's why we put the reserve at 300. Yes, we're very happy to take them home. I'm glad the girls are pleased but £300 was way too optimistic. My valuation of £150 was right on the money. There are some eye-catching items here at the auction today. 128, this is the Lalique scent bottle. But I can't wait to see the bidders' reaction to Glenda's trusty, or should I say rusty, old gent. And there's something I'm dying to know. At any stage were you ever tempted to try it on? Oh, we had many people trying it on. Even though it's unrestored, we're hoping to achieve around £150. And who's going to start me with this one at £200? £200 I'm starting. £100, good for an item. £100 I have in front, at £100. 160, over reserve. It's selling. 190? £190 in the room, £190. I'm going to sell at £190, all done and dusted? Glenda's knight in tarnished armour has earned her a pocketful of cash, £40 more than I thought. And as for the graceful Edwardian chairs, well, Juliet and Liz really did price them to go home. We had a reserve price of 300. If we'd made that, that would have been fine. But we weren't going to give these beautiful chairs away. Elizabeth has a shortage of chairs at home. And I think you'd like to have it, wouldn't you? Yes, I'm going to buy it off my sister. That's the way we'll have our own little private auction! It's been a successful day at the auction in Lincoln. So join us again and marvel at those skills of our expert restorers on Restoration Roadshow. Eric Knowles and his group of incredibly talented restorers face another set of challenges at the magnificent Burghley House. While furniture expert Tim Akers has his work cut out trying to resurrect a pair of water-damaged Edwardian chairs, Roger Hawkins has to be on his mettle when a Minton jug with a rather unusual repair turns up. Not to be outdone, the unflappable Malcolm Green brings his expertise to bear on an ingenious Victorian writing desk. Yet even he is surprised when someone marches in with a full suit of armour. But will this gallant old soldier be fit to do battle at auction and make its owner some money?